Tag Archives for " Stripes "
Fashion is a variable category and what’s new today, tomorrow is old news. But, people mostly wear what makes them comfortable, with a small addition of fashion trends. Usually, regular people don’t have money to buy latest design models, but they will combine one designed piece with the rest of their wardrobe. So, what new trends will 2017 bring us and will we be able to afford it? Stripes have been popular for years now, the fashion designers used them, and people love to wear them. It is most certainly that this trend won’t change in the near future. In your closet, you must have at least one piece of close that has tripe, if not, 2107 is the right year to change that. For years now, sneakers are not used for sports and recreation only, but they have become a fashion accessorize. In 2107 they will become even more popular. From sports models to those who have glitter or leopard print. More colorful than ever, with a vivid print and different design, sneakers threaten to become new stilettos. Many fashion companies have already taken this route. We now have art designs on coats, bags, and boots. Valentino first launched this trend, and then fashion companies followed. This year will also bring a variety of colors, but print art as well. For some people, this type of fashion might resemble Hollywood, but for those who are brave enough to try will be the latest discovery. You can’t fail when you decide to wear sports close, combined in an elegant way. People tend to feel more comfortable, out of business suits and high heels. 2017 will be the year of simple elegance, and the focus will be on sports clothes. One sports piece combined with more elegant close will give you look spectacular outline. I guess that world got sick of skinny jeans. They have ruled many runways for years now, and it has come the time to try something new. 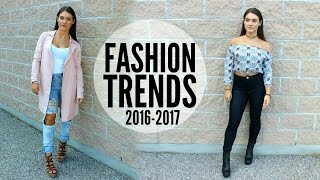 The new trends that will women try in 2017 are boyfriend jeans and straight cropped jeans. They want to feel comfortable and loose, everything that skinny jeans don’t allow. In 2016 we have seen many celebrities wearing flat shoes, and in 2107 we will say goodbye to 5-inch heels. Women will focus more on comfort and practical use. They will choose flat shoes that have fashion appeal rather than heels. In the same time, they will be able to spend a comfortable day, without changing them. It is one of the reasons why sneakers and mule shoes will be in high demand, for more comfortable and relaxing day.